We’re now into our second week of school, and I haven’t quite got this routine down yet. It must be the combination of the baby and work I guess. It’s a whole new schedule that I’m trying to learn. For instance, how do you manage a fussy 2 month old and a crazy car line that takes at least 30 minutes to navigate? And why did I forget the smell of food make babies so crazy hungry? At night, I do the dinner prep, start to cook, but have to switch with my husband by the time she starts to smell the food. It’s frustrating, but we’re learning. There’s been a few times this past week when I just wanted to throw in the towel, forget everything, and just go out for a nice comforting family meal. So night before last we did just that. 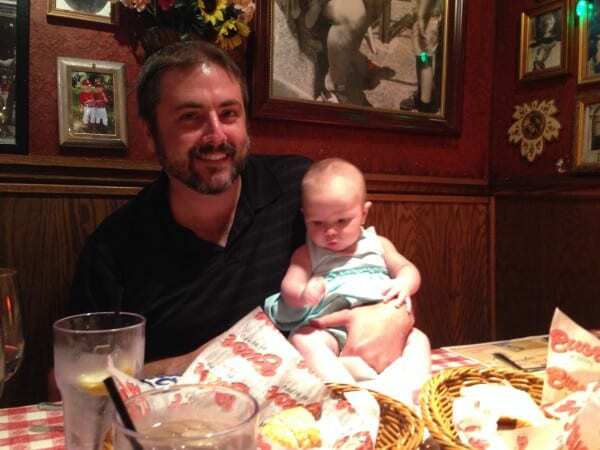 We went to one of our favorite restaurants, Buca di Beppo. 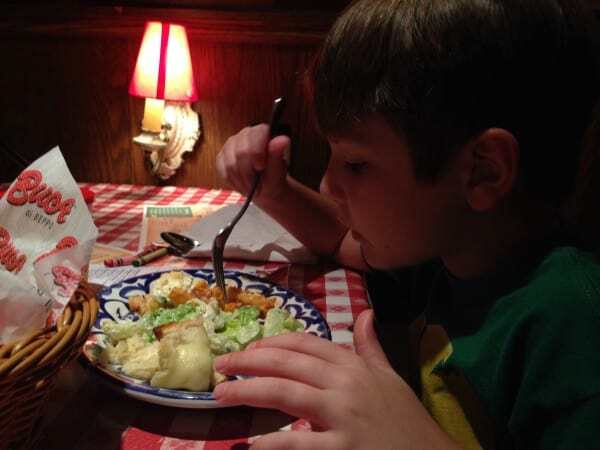 We all love Buca di Beppo because it’s so casual, so comfortable and so family oriented. It’s like visiting a family member’s house with all their wonderful decor on the walls. The decor also makes a wonderful distraction for little kids and babies. There’s so much to look at and so many pretty Christmas lights, they’ll never get bored. My family loves the food there too. 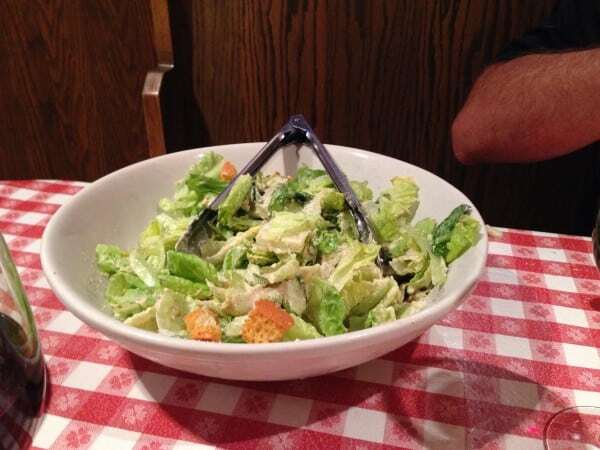 It’s just good, traditional family style Italian dinners. And right now they have an amazing deal going on. It’s a Feed 4 for $40 Meal Deal. Even though the baby can’t wait yet, we got this deal, thinking we’d just take a few leftovers home. But the portions are so generous there, we had plenty for lunch for all three of us the next day too! 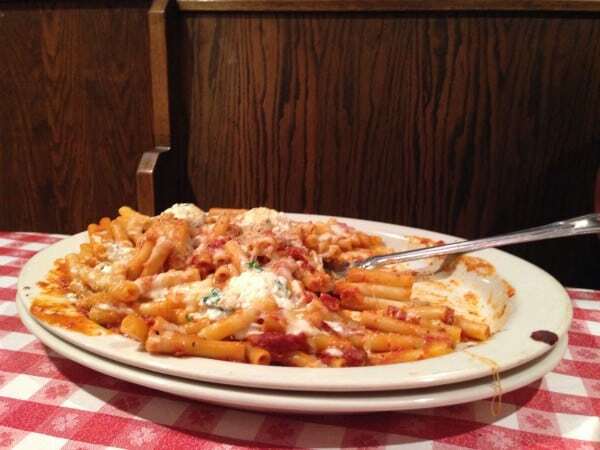 We ordered a large garlic bread, a large Caesar salad and a large baked ziti. It was all amazing! My son absolutely loved it, but of course what kid wouldn’t? Cheesy pasta? Yes please! Here’s our daughter. She was so interested in all the food and the smell. 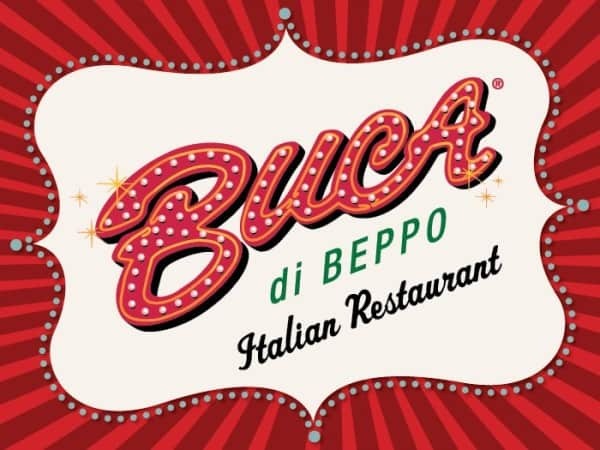 Use this link to make Reservations for your local Buca di Beppo. But don’t to forget to visit their site for the coupon for the Feed 4 for $40 Meal Deal. You need to print this coupon and take it in with you. You can also visit their website for more information about the restaurant and to view their menu, and find out more about their catering services. This is a sponsored conversation written by me on behalf of Buca di Beppo. The opinions and text are all mine.